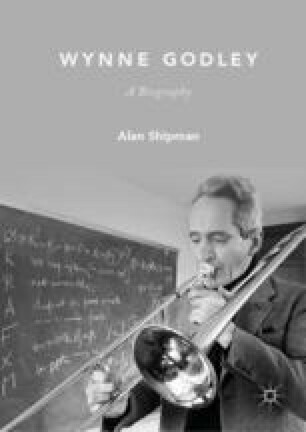 Forced to continue his macroeconomic research with diminished resources after losing his core grant, Godley continues to direct the DAE until 1988, but begins the search for an alternative base from which to pursue a second attempt at the subject’s reconstruction. Alternative sponsorship enables him to retain a Cambridge foothold at the university’s new management school, but he is increasingly drawn abroad, as interest in his new approach to the macroeconomy—and especially its ability to incorporate enlarged portfolios under financial deregulation—wins commissions to build models for central banks in Denmark and the Caribbean. He also makes his first visit to the Levy Economics Institute in New York State, connecting with Hyman Minsky’s ideas on financial fragility. Even without a large model, Godley can now detect the build-up of imbalances that will lead to build up of excessive debts and recession when they have to be paid back. His successful use of this to predict the end of the UK’s Lawson boom, and the pound’s disorderly exit from the European Exchange Rate Mechanism, wins him a recall to government as a member of the Chancellor’s independent panel of forecasters.